Lizzie Borden took an axe and gave her Mother Forty whacks. When she saw what she had done she gave her Father forty-one. Purposefully I hadn’t read anything about the Borden murder case prior to reading See What I have Done, and I’m not even sure that I will now. Although I will admit that I do have a bit of a morbid curiosity about the finer detail. This is a perfect debut novel. It can be tricky to base historical fiction on events that have actually happened, but Schmidt does so with ease. I’m pretty sure I’m supposed to loathe Lizzie Borden. But in actual fact it was her sister Emma that I didn’t like, for reasons that I can’t quite put my finger on if I’m honest. 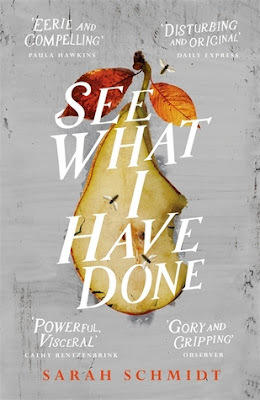 See What I have Done is the tale of Andrew and Abby Borden are found murdered on 4 August 1892 by their youngest daughter Lizzie (who is actually Abby’s step daughter). Their other daughter Emma is quickly summoned home by Lizzie. Father hurt. Mrs Borden missing. A terrible accident. Come home. There are two significant things about this, the first is ‘Father hurt’ when it is tragically so much more serious than that. The second, ‘Mrs Borden’, at some point for reasons that are never exactly clear Lizzie stops referring to her Step Mother as Abby and starts calling her Mrs. Borden. I can't say too much more, as you need to discover See What I Have Done for yourself, its; an intriguing novel, and an impressive debut. A must read. See What I Have Done is available now via Amazon online and all good book shops.